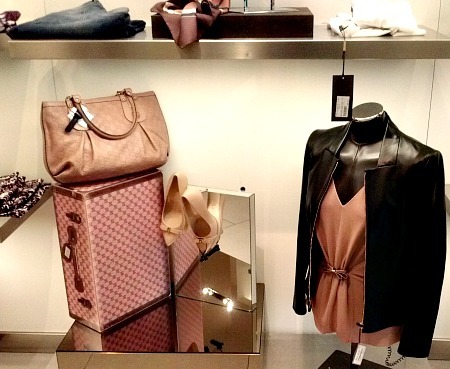 Nothing beats Florence shopping tours if you're coming to town to get some great Italian clothes or accessories! That's why visitors flock to Firenze all year round to take advantage of the great deals at the outlet malls....Gucci, Ferragamo, Pucci, Prada, Armani......you've heard of them right? 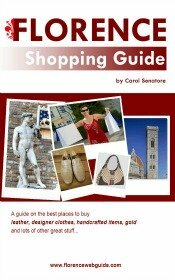 Read about shopping tours from Florence below! 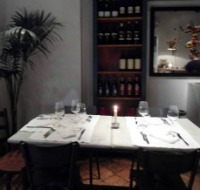 This is the most popular of all the Florence shopping tours. If you are a serious shopper who would like to take a day trip looking for designer names at a discount, this tour is for you. 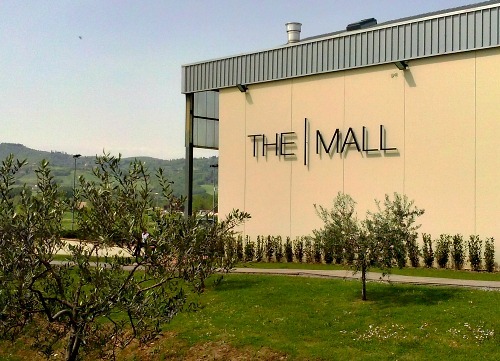 You hit all the hot spots and favorite big names: the Space outlet for Prada and The Mall for Gucci, Pucci, Armani, Fendi, Ferragamo (there's also another Prada store at the Mall in case 'the Space' was not enough!). One very big advantage of this tour is the convenience of being comfortably taken to these spots which can be a bit out-of-the-way and not so easy to find on one's own. Avoid the hassle of figuring out where these outlet centers are and just dedicate all your energy to finding great bargains! Find out more, read reviews, check availability and book this tour! The selection of Florence shopping tours has recently been enriched with this very special offering: the Fashion Walking Tour. If you would like something different from global designer names, consider visiting artisan boutiques and historical shops that are part of the creative background of Firenze! First, you visit the Leather School located in a medieval cloister. This is a renaissance workshop where you see leather goods being made (all goods are available for purchase too). Then you visit the Gucci museum, but not just for shopping (you can do that too of course! ), but to learn the history of this iconic Florentine family of designers. 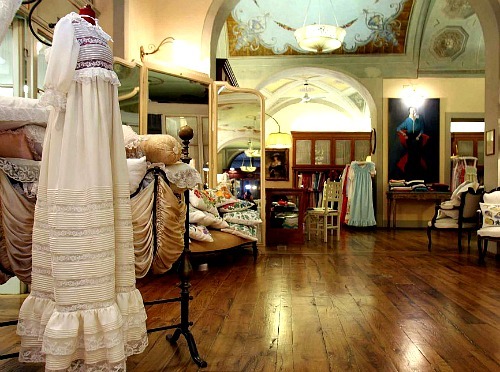 Next, it's off to Loretta Caponi's embroidery boutique, a shop whose articles are so exquisite that Princess Diana had her wedding trousseau made here. Lastly, the piece de resistance, the Santa Maria Novella Apothecary. This is a breathtaking palace specialized in making teas, perfumes, natural beauty products and the like, with recipes perfected by medieval and renaissance monks and still used today. As you can see, this tour is truly one-of-a-kind and is perfect for shoppers who want an 'out of the box' Florence shopping experience. 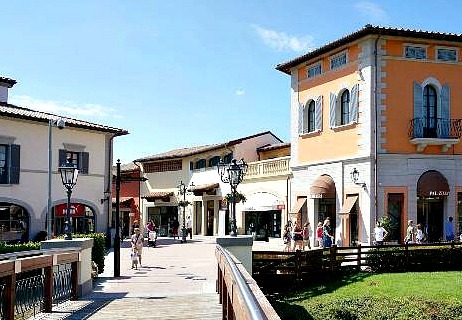 Florence shopping tours also offer a trip to the second most popular outlet center in Tuscany: the Barberino Designer Outlet. Built like towns used to look in Tuscany during the renaissance, this discount village makes for an a lovely quaint day out for shopping. With over 100 designer shops and 5 gourmet eateries (including a Lindt chocolate shop!) 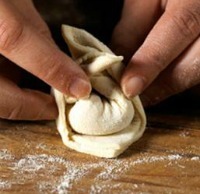 even the most discerning customer will find something to their liking! The vast choice that this outlet offers keeps shoppers coming month after month to find great bargains on also the lesser known Italian and European labels.